The three main fundamental pillars of Arithmetic are Percentages, Averages, Variations, Ratio and Proportion. So the aspirant should create an in-depth understanding about the concept of Ratio, Proportion and Variation'. Application of Ratio and Variation are broadly expanded in all the other Quantitative Topics. Hence it is a mandatory required topic for your serious preparation for the exams. 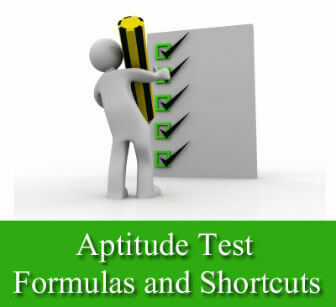 In this article we provide important formulas, shortcuts and tricks to solve aptitude questions on ratio and proportion with help of examples. In this article, we provide various techniques to solve aptitude questions on quadratic equations with the help of tips and tricks. A quadratic equation has at most two solutions. Mathematically the solutions of a quadratic equation are called the 'roots' of the equation. There are possibilities to get real or complex roots for a quadratic equation. "Without at least one profit and loss question an entrance exam is incomplete". This statement may emphasis the relevancy of this topic. Except CAT, all the other placements test and competitive entrance exams such as IBPS PO, SNAP, FMS, IIFT, NMAT, CMAT are including multiple questions from this area. Especially in MAT exam this is one of the lucrative areas by means of scoring. Read on to learn important formulas, tricks and tips to solve aptitude questions on profit and loss with the help of examples and detailed explanations. In the new pattern of all B-school entrance exams, different exam boards giving an importance in this area. An average of 4 to 5 questions in almost all the top level exams (CAT,XAT etc)can expect from this chapter. XAT contains a large number of questions related to the user defined functions than the pure mathematical functions. A clear theoretical awareness of the concept of functions is required to solve most of the questions. SI & CI is basically a continuation of the application of percentage calculations. A well understanding and a rigorous practice will make you able to tackle the SI & CI questions easily and interestingly. Questions from SI and CI is common in most placement tests, bank PO, MAT,CAT and XAT competitive exams. This article provides important formulas, concepts, tips and tricks to solve aptitude questions on SI & CI. All placement test and competitive exams consist directly or indirectly test your basic skills in the area of algebra through simple equations. Here we explain various concepts of simple equations along with the ways to solve them using examples. So far we have discussed about simultaneous linear equations in many variables. In this special module we are going to consider the extended properties of simple equations, which is generally called 'Special Equations'.